This is exciting. I’m doing a post on Indian food! I love, luuuuuuurve Indian food. (I actually don’t know anyone who doesn’t) Although I have eaten at Indian restaurants many times, the first time I cooked an Indian meal myself was probably 7-8 years ago when I shared a flat with a wonderful girl called Eike from Northern Germany. I remember walking into her place when I was hunting for a new room. The kitchen was decent sized, which is hard to come by in Germany, the sun was shining through the big kitchen window, and I spotted a small shelf of cookbooks. At that moment, I thought, I need to move in here! This person actually likes food and cooking! A few month later, I moved in. I started looking through her books soon after and one of them was a simple Indian cookbook written in german. I think I might have cooked a chicken curry. What kind, I do not recall, as my knowledge of Indian food back then went as far as “rogan josht” (“say what? ah! lamb curry!”), “vindaloo” (the spiciest curry on the menu in every Indian place so I loved it) or “butter chicken”. I think the book was pretty basic too but it had all the right spices I think, because when I cooked it, it actually tasted like food I ate in Restaurants! Ha! I realized it wasn’t as hard as I thought. I didn’t cook Indian regularly though until I discovered Madhur Jaffrey’s World Vegetarian. It’s a fantastic book for a general overview of Indian as well as other ethnic food. This book was introduced to me incidentally by Paige who became my best friend over the years and moved into the flat one year when Eike went off on an exchange program. I discovered much more about Indian food with this book. I also discovered cooking beans from scratch tasted a million times better than buying canned ones. Paige and I cooked a lot in that year when we lived together. We fed many hungry friends from uni who seemed to love our food (I think?) although looking back, I do think our food was kind of too spicy. Nevertheless, now Paige turns out to be one of two people in the world I can cook with, (the first one being mum) and I also learned to cook 3-4 dishes at the same time. Madhur Jaffrey is from Delhi, so a lot of her recipes are northern Indian in World Vegetarian. I have a friend here called Malavika who is a Kiwi but originally from Kerala. I have always wanted to make South Indian food but it seemed more complicated than its counterpart. (Dosa? Idli??) I haven’t tackled making Dosa yet, but a few weeks ago, Malavika came over to show me her mum’s amazing Sambar recipe that she’s been raving about. Sambar is a sweet-sour lentil stew made with Toovar dal (pigeon peas). It definitely seemed like it had more steps and spices than the regular Hyderabadi lentil stew that I make often. It turned out to be delicious as promised and I made the recipe again the other day. I tweaked a few things. Instead of boiling the onion and veggies in water and adding the cooked dal, I fried the onion and tomatoes, and the masala paste, before adding the veggies and dal. And last but not least, on cooking lentils; I own a pressure cooker which makes cooking a speedy process. If you don’t own one, try looking on eBay to see if a pressure cooker needs a new home. It won’t be as pricey as buying a new one, and it will save you time and energy when you cook beans and lentils next time. Serves: 4 or more if you serve other curries/pickles/chutney with the sambar. 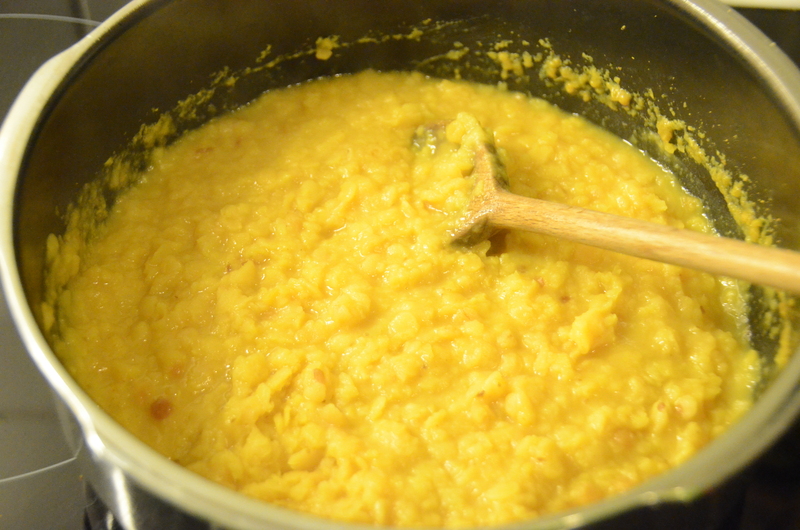 -Place the lentils in a pressure cooker with 3 cups of water and a tablespoon of oil and turmeric. If using a pressure cooker, bring the pressure up to high, turn the heat to medium-low and maintain the pressure for 20 minutes. Release the pressure by running the top of the pot under cold water. -Place the lentils in a heavy based saucepan with 4 cups of water and turmeric. Bring to boil and let it simmer for an hour or more, until the lentils are soft. I suspect if you soak the lentils over-night, it will take a little less time to cook. 2. Make the masala. In a small frying pan in a medium-low heat, add all the ingredients for the masala except the sambar powder. Roast until fragrant, but do NOT burn! 3. 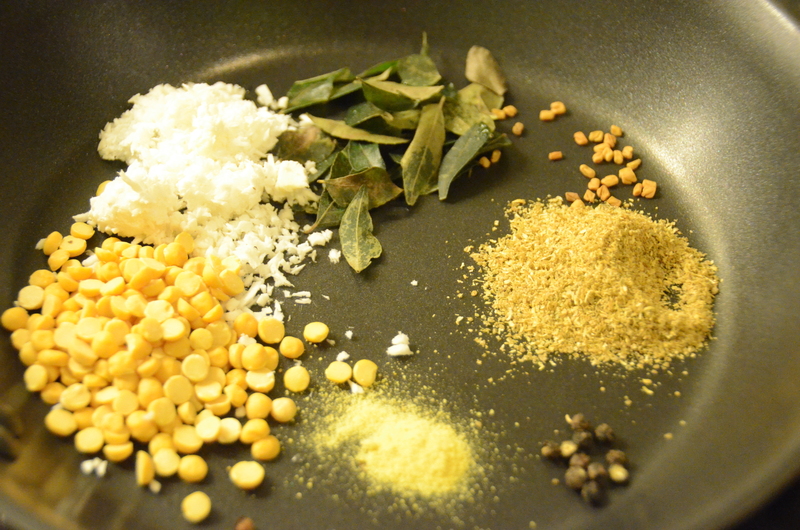 Add no.2 with the sambar powder in a spice grinder/blender with enough water to make a smooth paste. 4. Heat the oil in a large saucepan over medium-high heat. Fry the onion until lightly brown. 5. Add the tomatoes and cook until soft. Turn the heat down a little, and add the masala paste and cook for 2-3 minutes. 7. Add the vegetables. Cook until tender. Add the golden syrup and tamarind paste at this stage. If you use tamarind paste, try adding bit by bit, as every paste seems to have a different concentration. Check for sweet/sour balance. 8. For the seasoning, heat the oil in medium-high heat. Add the mustard seeds and wait until they pop. 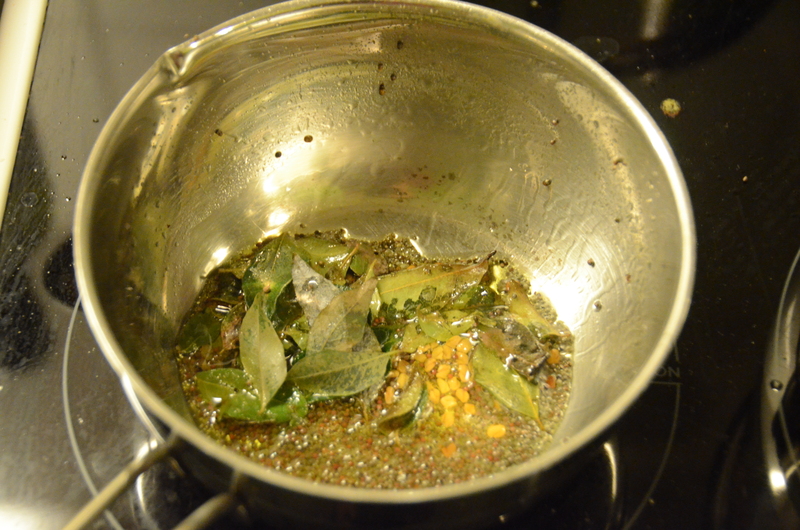 Add the curry leaves, dried chilis and fenugreek seeds and stir around for 20-30 seconds or so until fragrant. Add to the lentils and stir to mix and let the flavour mingle. 9. Serve with basmati rice, and coriander leaves sprinkled on top. I have made your Sambar and it is absolutely yummy. My kitchen was a bit of a mess, let me just say: I should have made the paste in a spice grinder as you said…Just had the last bowl for lunch today and I needed to tell you: we love it! Hope you were not out in the Unwetter, N.
I’m glad you loved the sambar! Yay! I know it’s an amazing recipe. I need to thank the mother of my friend who gave me the original recipe, if I ever meet her in person. Thanks for trying out the recipe! Have a good week! Ange.